One of the many impressive products from the leading airsoft and BB gun manufacturer KWC, the Competition Model 75 blowback pistol is powered by Co2 and has an appealing design that makes it a favourite of many airsoft skirmish enthusiasts. 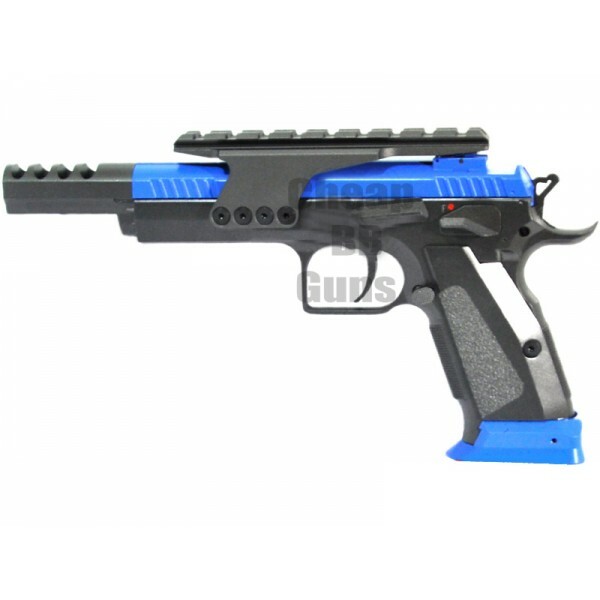 The pistol comes in a colour combination of blue and black, and is a must have in your collection of BB guns. If you aren’t into collecting, get this Co2 blowback pistol for practise target shooting or for your skirmish gaming activities. Either way, you will not be disappointed. Made entirely of metal, the Competition Model 75 pistol has a smart design with a removable top rail, and extremely smooth slide cycling. The BB pistol also "clinks & clacks" like a real metal gun, giving the player the feeling of holding an authentic pistol. The overall length of the gun is 277 mm, while the inner barrel length is 110 mm. It weighs just 1.4 kilos, making it lighter than many other full metal pistols from KWC. The Competition model 75 has an FPS of more than 350, and the magazine capacity is 22. The single-fire semi-automatic pistol comes with a Co2 magazine and adjustable hop-up. The design of this airsoft pistol enables the user to hold it firmly, whether to master target shooting skills in a shooting arena, or to beat the opponent in an airsoft skirmish game. Care should be taken when using this blowback Co2 rifle from KWS, as the pellets fired from this powerful metal BB pistol travel at great speeds and are capable of injuring people. This pistol should be used in a controlled environment, where use of safety eye-wear, face masks and other accessories like vests is ensured.